The term fluorescence is derived from the name of a rock. The name ‘fluorspar’ is itself derived from the Latin ‘fluo’, for flow, and ‘spar’, a term referring to non-metallic minerals. 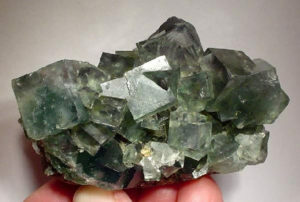 Fluorspar was given this name because it melts easily. The offset between the peak excitation wavelength and the peak emission wavelength is called the ‘Stokes shift’ in honor of its discoverer, George G. Stokes. 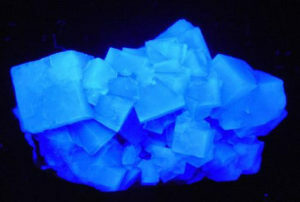 Images of fluorite under white light (left) and fluorescing. Used under Creative Commons License.